It was pretty slow going for a while there. In fact, there was a period of two weeks (between July 23 and August 7) where I didn’t sell a thing. Thankfully sales picked up a bit and I ended up having a decent if unspectacular month. 1. Yard sales: 330$. I had a sale a couple weeks ago that I didn’t advertise whatsoever. I made around 100$, which is below average, but while everything was out on the curb I was able to weed out the clutter that wasn’t going to sell anytime soon, if ever. That set me up nicely for yesterday’s sale. I wasn’t able to put out as much as I usually do, but still had success because the things I brought were of better quality. I ended up making 230$, despite it being super cloudy and near rain for much of the day. I think I would have been cleared out if it had been sunny all day. By the way, those framed images I mentioned in my last post didn’t last too long. The first to sell was the only non-religious one. 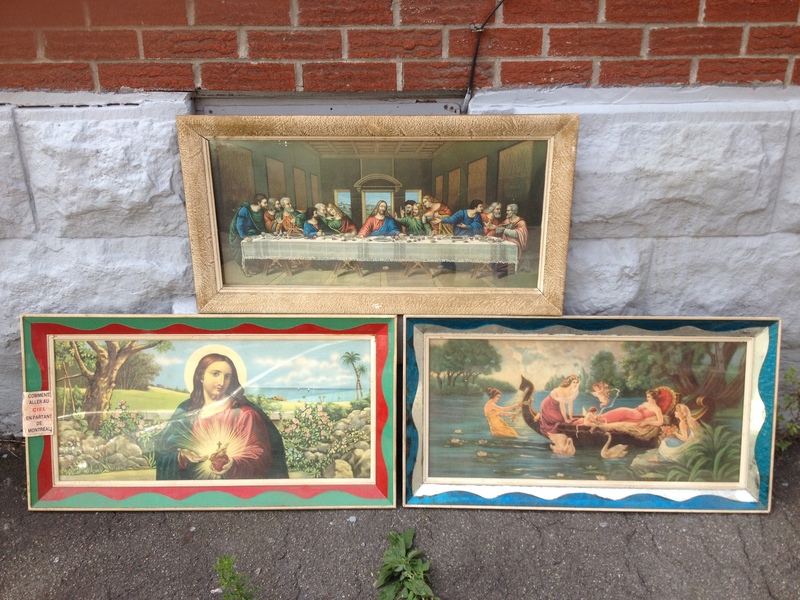 The second was actually kitschy Jesus, who I figured would be the hardest to sell. The last supper sold last. I priced them all at 5$, which was maybe too low but I was happy to move them quickly. Looking back, this stuff might actually be in style, at least in the artsy / hipster Plateau. 2. 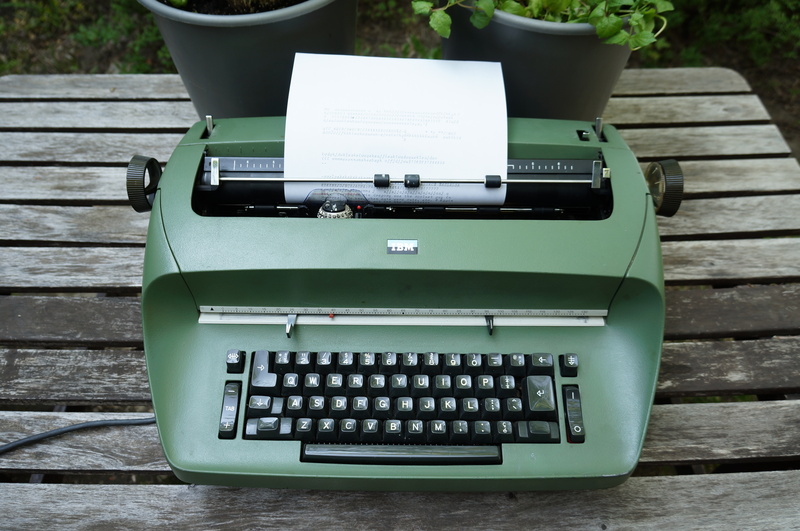 IBM Selectric Typewriter: On Kijiji for 50$. The Selectric was very popular in the 1960s. It was very bulky and quite heavy. Found this May in Rosemont. 3. Perfumes: To a reader for 40$. I found a nice, nearly full bottle of Miss Dior near Snowdon metro last week that went for 30$. It was vintage, probably from the 70s. The other two were smaller, half full perfumes by Annick Goutal that I found in Outremont. Unfortunately I didn’t take any pictures. 4. 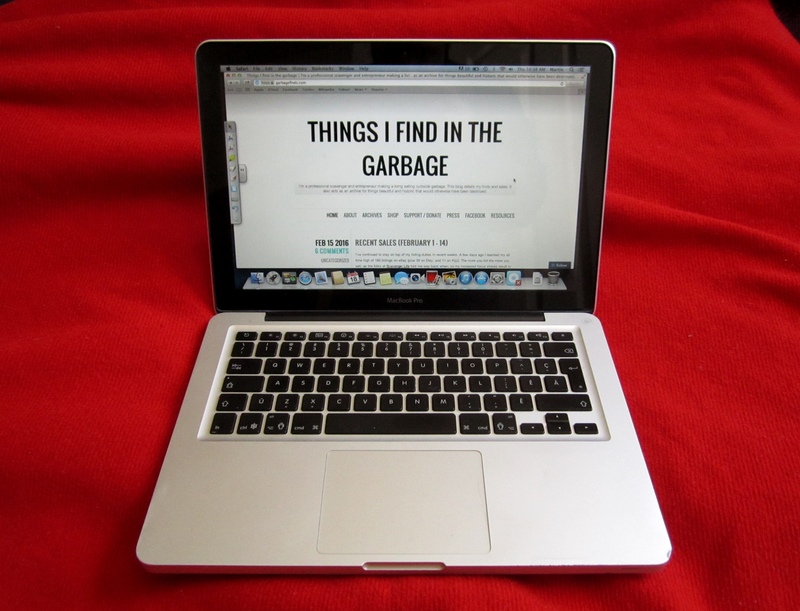 Macbook Pro, for repair: On eBay for 250$. I bought a new battery for it, so my actual profit was around 200$. This is the one I found back in February. It seemed to work at first (at least after I took out the old battery which was bulging and impacting the trackpad), but after a while it became really slow and painful to use. It was a 2009 model, so chances are the original hard drive was cooked. It’s probably an easy fix for whoever bought it. Found in TMR. 5. Vintage Tiffany jewelry box: On eBay for 50$. I’d guess this box was made in the 20s or 30s. Anything Tiffany related is worth a bit of money. Found January 2016 in NDG. 6. Rodenstock Rocco eyeglass frames: On eBay for 44$. I listed these a long time ago. I have a faint recollection of finding in the Plateau a couple years back, but I can’t be certain. 7. 1964 Lindsay Place (Pointe-Claire) High School yearbook: On eBay for 40$. I’ve heard of people having success selling old yearbooks, but only recently did I try doing it myself. 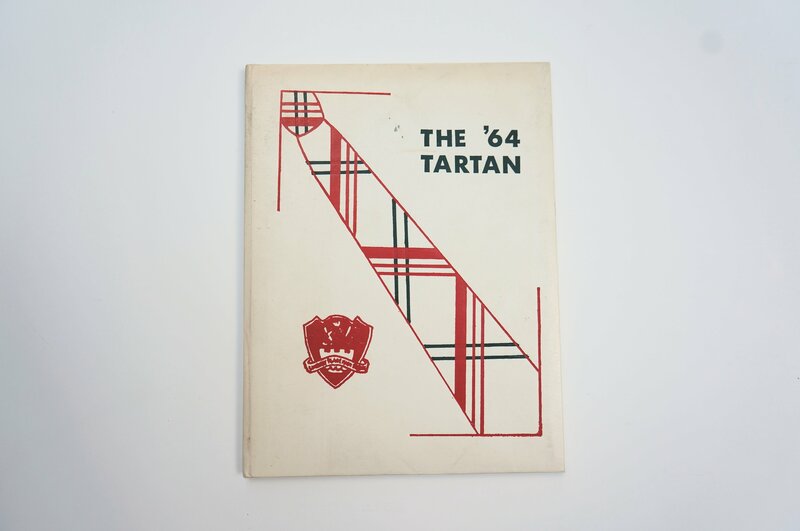 This yearbook, one of several I listed sold within a day. I was pretty happy about that. I’m sure the rest will be long tail items, but eBay’s fees for listing books are lower for just that reason. Found in TMR. 8. 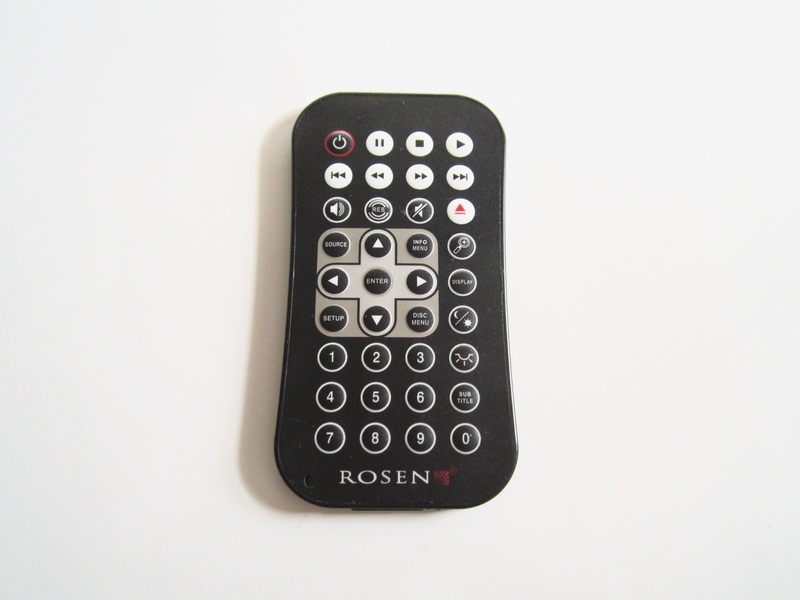 Rosen remote control: On eBay for 27$. I don’t think there’s anything less exciting than selling remote controls. I don’t even know what this remote was for. Still, selling them is pretty easy and they make me a bit of extra cash. I only recently realized that this was market I could capitalize on. 9. 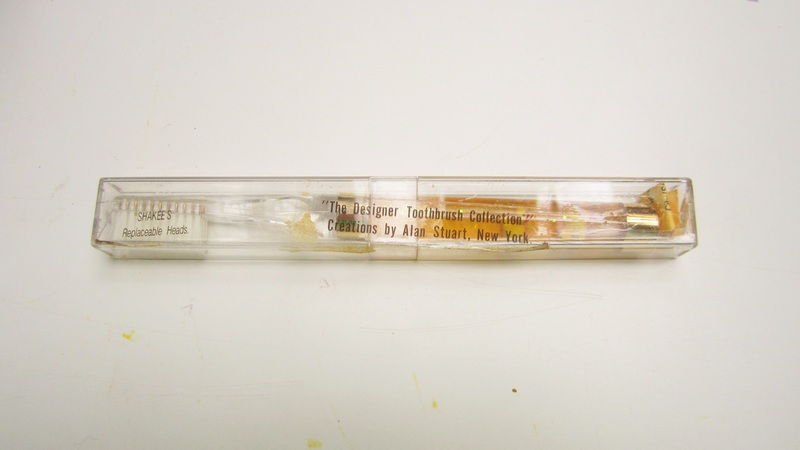 Vintage Alan Stuart designer toothbrush: On eBay for 30$. It was in its original box. Saved from a cheesy bag in June of 2015. 10. 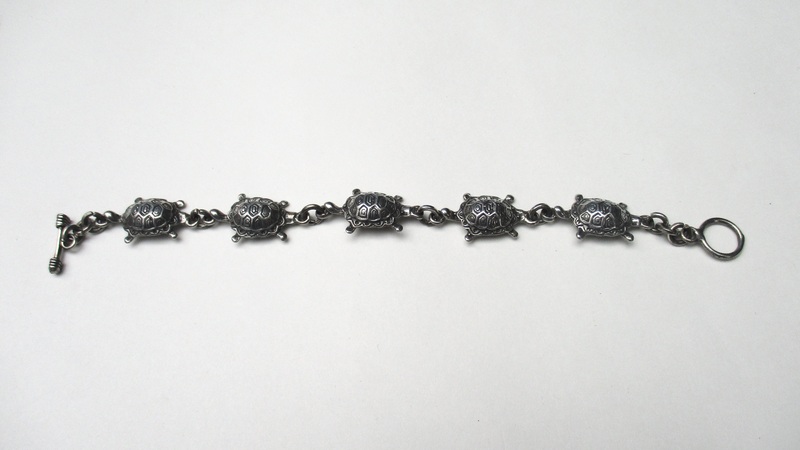 Silver turtle bracelet: On Etsy for 30$. My first Etsy sale since May. 11. 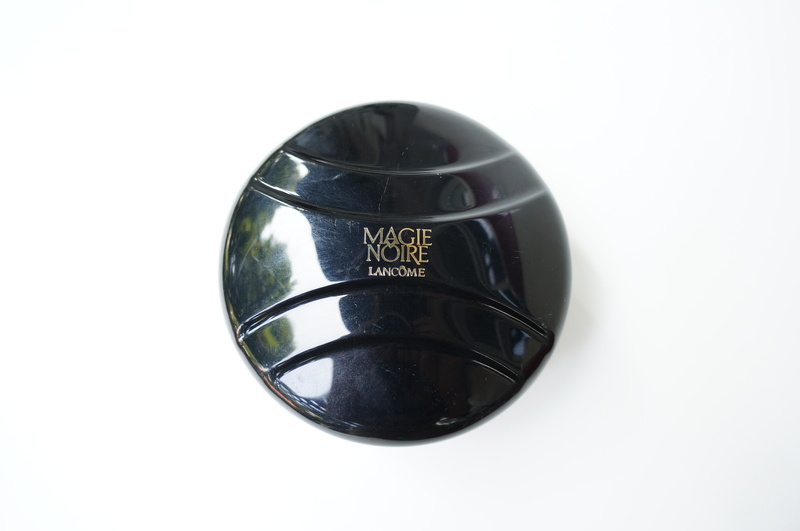 Vintage Lancome Magie Noire perfumed dusting powder: On eBay for 80$. This stuff seems to be pretty collectible! Found last month in Outremont. 12. 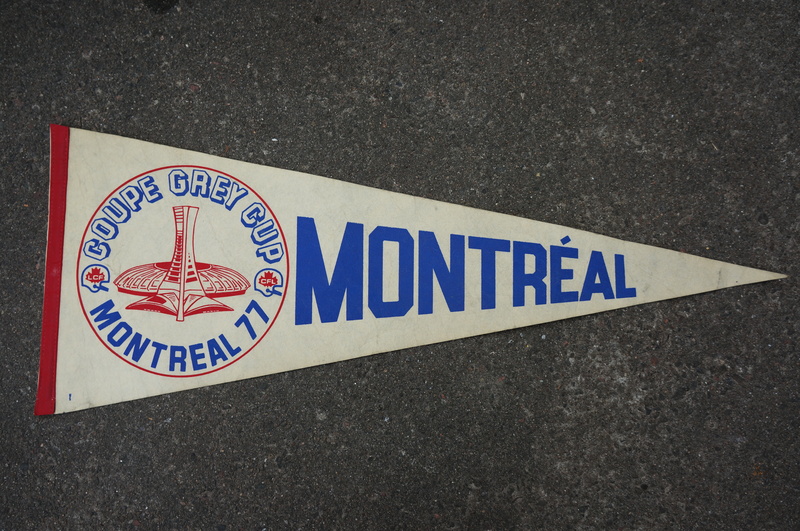 1977 Grey Cup pennant: On eBay for 100$. I found this over two years ago. I kept it myself for awhile, using it as a decoration. I like collecting Montreal related stuff, and especially enjoyed the image of the Big O. However, I didn’t end up putting it up at my last place, and when I didn’t display it at my new place either I figured I might as well sell it. I got a very good price so I’m pretty happy. Found May 2014 in TMR. Total: 1071$, 15051$ since the new year. I’m happy to hear things are starting to move again. I worked on those Selectrics in various offices, when I lived in Montreal back in the day. They were lovely machines. Au contraire, there is something even less exciting than selling remote controls. I see some blogs about people who are successful selling glass microwave turntables/plates. Now that’s dull though profitable. That does sound less exciting. I’m not sure I even want to get into that. It could be one of those things that are profitable enough for Americans, but not really worth it for Canadians due to the higher shipping costs. Someone’s been trying to sell a microwave plate on Craig’s list, but in the wrong section (I think books). I finally looked at it last night, figuring it was just never deleted, but it had been updated 30 minutes before. And it turned out he had a bunch. That’s when I assumed he had been gathering the plates from microwave ovens found on the sidewalk. Something that might bring in money, but doesn’t take up space like the home oven, and you don’t know if the oven is good until you can get it home and try it. Like a variant of the people who snip off the AC line cords, or break open the back of tv sets for the copper deflection coils. You get some return for the effort, you might get more if you take more, but it’s less certain. I o grab remotes when I see them, you never know. Even if you can program a universal remote for a device, you may miss some functions. I once found a spare remote for my VCR, which seemed a lucky occurrence. The ribbons for those old IBM Selectric Typewriters are good sellers also. I had 12 listed and they all sold within a couple of months for $10-$16 each. You are killing me! Five bucks each for those pictures! Ugh! Totally realize that they were big and you wanted them gone but dang! Yeah I probably should have started higher, lol. When I sell on eBay I try to maximize my profit for each sale. With yard sales I price low (often too low, I admit) in part because I’m happy just to see the stuff go. There’s always more garbage as I like to say. These frames also had a bit of a musty smell to them, nothing too bad but in my mind they warranted a lower price as a result. I am a 32 year-old businessman who almost grew up in the digital age.But I still love print and subscribe to two daily newspapers in print.I needed three or four skilled tradespeople as employees for my small firm last month so I put three or four ads on Craigslist and Kijiji.But I got a lot of bogus responses and many job seekers with unrealistic expectatiions also contacted me.I wasted a lot of time and only found one qualified employee in two weeks of trying through Craigslist and Kijiji.Then I put an ad in the Saturday print edition of The Montreal Gazette,hoping for better results.Within three days,I found and hired the three skilled tradespeople I was looking to hire. Just want to let you know that print publications still give good results and still have a big readership.Many young people still believe in print and I hope more young people will subscribe to print newspapers.The internet is not very good at everything.